Growing up, I used to gobble up Peanuts comic strip books. I was fascinated by Charlie Brown and the ridiculous and lovable characters surrounding him. He seemed the be the only sound, yet insecure, mind of the bunch. 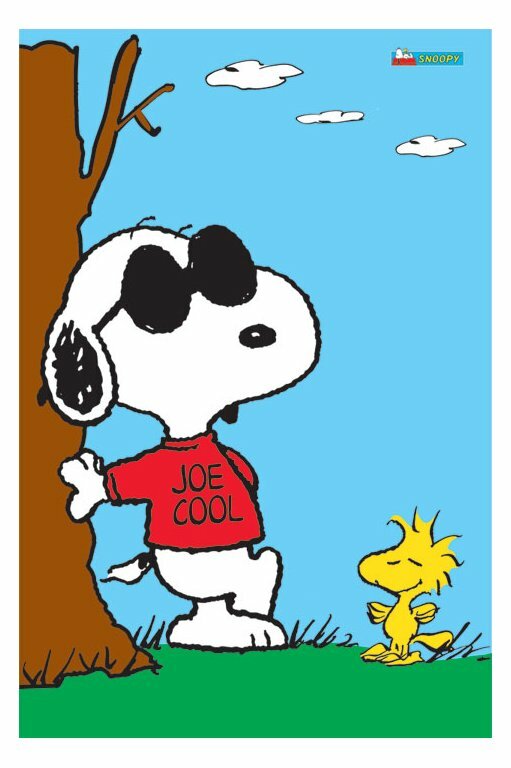 My favourite character was Snoopy and his imaginative alter egos – the WW I flying ace, the club reporter, the writer…and of course, Joe Cool. Joe Cool was the pick of the litter, for me. My mother would tell the story of how I would come down the stairs after being summoned for dinner, me wearing my dad’s sunglasses and a turtleneck and proclaiming “I’m not Paul, I’m Joe Cool!”. (“Ok Joe Cool, eat your broccoli”). Joe Cool was, well, cool. He was this character, separate from the others, pretending to be somewhere where he wasn’t supposed to be (college), and seeking attention from the ladies. He would be often be seen leaning against something, acting aloof and distant. He didn’t say much, but he tried to sound groovy when he did. He was an observer, never part of the fray, only getting involved when he really needed to. He was detached from the world, too cool to talk and engage, but still hung around. He was often alone and just tried too hard. He was a poor man’s (dog’s?) version of the Fonz. Fast forward many years – I have long stopped reading my Peanuts comic strip books, but in a life-imitates-art kind of thing, I funnily enough have taken on the persona of Joe Cool…without knowing so. I am around the action, but not part of it. I am a spectator in life, rather than diving into it. I seek attention from the wrong people for the wrong reasons. I am aloof and emotionally distant. I am grandiose and yet feel less than. I watch things unfold, and avoid it, yet secretly desire to be a part of it. I am alone and just try too hard. I was the poor me’s version of me. It’s that cool distance and yet wanting to be a part of Joe Cool that really struck a chord with me. It’s like when I would try and hide at my desk and not want the teacher to call on me to answer a question, and yet I would get so upset and hurt when he or she didn’t. I felt that I knew the answer better than anyone, yet didn’t feel I deserved to be recognized for it. I was like the referee in a game – I was around the action, yet no one noticed me until I made a mistake and then I was jumped on for it. A lot of alcoholics talk about not feeling a part of this world. I certainly felt the same – it’s like I was here on your planet just to take notes. Then, when the mothership came calling, I would be transported to the planet where I knew instinctively knew how to live. I didn’t have that instinct here. My alcoholism wasn’t defined by these feelings, but it certainly had a role in it. That gray zone between wanting to be seen and not wanting to be seen was almost as dire as the zone between can’t live drinking can’t live without drinking. Through my recovery, I have been able to put a lot of this to rest. Not all of it, though. I wish I could say that I jump into life headfirst, bubbling with joy and being a part of everything I see. It’s difficult to make that leap sometimes, even these days. I still have parts of me to cling to that Joe Cool Gospel of Being. I still feel that it’s safer to be along the wall, avoiding having to open up and be vulnerable, to sit back and take my notes, to feel apart, and not a part of. Faith brings me to a place where I can do it, though. It’s frightening at times to make that jump, but it’s never as bad as I make it out to be. It’s never the end of the world when I take risks. It’s never a bad thing to try. But sometimes I still shirk. In the end, this is something I continue to work on. It’s something that comes back at me, but not as strong, like the lightening up of waves upon the shore as the tide goes out. It’s ongoing. The key is feeling that I deserve to be a part of things, that it’s not only for those who somehow fell into knowing how to be a part of things. It’s about me not seeing myself as less than, but right sized. I am you and you are me. No better, no worse. I am here the same reason you are – to help one another, to bring joy and support and love to everyone. Joe Cool may have been an amusing 2D character in the paper. I was a not-so-funny 3D flawed character in life. But like that dog-eared comic strip book, it’s time to take my old life and way of thinking, and shelve it. Lots of new adventures to read…and write. Oh how this resonates with me. On the outside looking in. Feeling different. Sometimes cool, and sometimes not so cool. This really struck a chord. Recently it occurred to me that a lot of my dissatisfaction comes from some discord between who I really am and who I think I should/could be. Example: I hate being told what to do, but equally hate taking the initiative. I hate being late or feeling rushed, but I am not good at managing my time. I feel like two sides of my personality are often at war with each other, but I’m sure there must be some way for them to meet happily. I know change is hard and I’m also not sure how much is realistic. I’m hoping awareness is the first step and that the answers become clearer over time, whether it’s change or acceptance. When I think back on all of the positive things I’ve experienced so far since getting sober, I am optimistic. Hi BBB – great comment. I totally get what you say about your two sides of your personality being at war with one another. I know that I will never get it perfect, but who does or can? There seems to be this underlying current of trying to reconcile things in our lives, and that constant friction has always been a source of pain. And of course, we self-medicated our pain. You are correct that self-awareness is a great first step. I wasn’t aware of all this until I got sober. It’s still challenging now, but at least it’s in my field of vision. And yes, time will help us along. Snoopy does rock, doesn’t he? I don’t know about Joe Cool(I did not grow up in the States) but I love snoopy! I went through the phase where I was getting these clear ‘life messages’ through the daily peanuts strip in the newspaper. 😉 I have learned, that when you continue to choose the path of faith, new paths open up. It’s like ‘faith’ is another name for ‘path’. I wish you a great journey of faith! You are absolutely right! Faith truly has opened new paths for me. I don’t think I would be where I am without it. It would be like a rudderless boat. Thank you so much for commenting and stopping by – I really appreciate it!